The greatest sporting experience I’ve ever had started with only a glimmer of hope. When the game ended I thought it was the most exciting basketball game I’d ever seen. But it was only on reflection years later that I began to truly appreciate the enormity of what I’d witnessed on December 7, 1977. Energy and effort to rally teammates. Courage to battle against impossible odds. Giving ten thousand people a sense of immortality. And those things had nothing to do with the basketball game itself. On that December night I sat in the stands and watched William and Mary beat the #2 ranked team in the country, North Carolina. If you were a Tar Heel fan it was an aberration. A hiccup. If you were a W&M fan, however, it was historical. It was amazing. North Carolina had played for the collegiate championship the prior year against Marquette. The 1977 team featured Phil Ford and Mike O’Koren, two of four Tar Heel starters who would be drafted by NBA teams. Ford was the starting point guard for the gold medal – winning USA team in the 1976 Olympics. 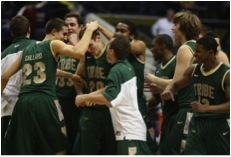 The William and Mary Tribe team featured players who would go on to careers in accounting, law and business. North Carolina was coached by the legendary Dean Smith. William and Mary was led by an unknown first year coach named Bruce Parkhill. The Tar Heels were a perennial top-10 team. William and Mary was one of only five schools that had played Division One basketball for at least 50 years and never played in the NCAA Tournament. They were going to kill us. The Tar Heels warmed up with quiet confidence, and the William and Mary players looked nervously over at the Tar Heels they’d watched on TV and read about in Sports Illustrated. Prior to tip-off a skinny player with short hair ran out onto the court and whispers spread through the crowd. His hair was shorter than we remembered and he’d lost his ever-present five-o’clock shadow. But we knew that face. And that crazy look. His teammates surrounded him at half court and they all began jumping up and down. The Tar Heel players glanced over and wondered what all the commotion was about. Suddenly the skinny player let out a yell that you could hear throughout the gym. The place went crazy. Suddenly, all bets were off. Early in the first half, Phil Ford brought the ball past half court, executed a slick cross-over dribble and exploded towards the hoop. At least he tried to. Tribe player Jack Arbogast cut him off and caused Ford to dribble off his foot and out of bounds. Arbo glared at Ford and let out a guttural yell, like a snarl. Ford did a double-take and fans saw the first glimpse of something unexpected on Ford’s face. Doubt. Ford was held to two points in the first half and William and Mary led at halftime 32-31. It was a hotly contested second-half. Ford did have twenty points in the last fifteen minutes to lead the Tar Heels on a furious comeback, but the Tribe’s John Lowenhaupt was the best player on the court that night. In the last minute of the game, Bobby Boyd and Billy Harrington hit free throws to ice the game and ensure a 78-75 Tribe victory. When the final buzzer sounded, I remember running out onto the court and hugging everyone in sight. I was thrilled for my friends on the team. Billy. Zinger. Arbo. Hopper. Noch. Teddy O. Bobby. They’d done it. Like his Tribe teammates, the skinny player basked in the joy of the moment. He also looked exhausted. He hadn’t played a minute in the game, but he had perhaps fought harder than anyone that night… just to be there… to support his teammates. That player was John Kratzer, the Tribe team captain, who had been battling an aggressive form of cancer. The previous year his doctors had discovered an inoperable tumor near his kidney and the cancer was spreading. They’d recently found a blood clot in his lungs. Prior to the game, he had been back home in Atlanta, to be with his family and to receive yet another round of chemotherapy. The prognosis was not good. Players on the William and Mary team would get quiet and tight-lipped when anyone asked how he was doing. He was a larger-than-life personality around campus, and was welcome everywhere he went. His practice habits were legendary and he was always able to pick it up a notch when others were running out of gas. His play on the court was all energy and grit. He was fearless. His nickname was “Kraze.” It fit. When Kraze ran onto the court that night, we could see he’d lost a lot of his hair from the chemo treatments and he was at least twenty pounds lighter than we’d last seen him. But he was back. And if anyone was going to defy the odds, Kraze was the guy. For that one night, we all believed anything was possible. Beating Dean Smith. Conquering the Tar Heels. We could even beat cancer. As we jumped and laughed and hugged, we felt invincible. Afterwards, Kraze told his teammates he wasn’t going to leave them “until I can’t take the pain any more.” He attended classes. He suited up for games. He traveled with the team. He maintained his goofy, you-never-know-what’s-coming-next, sense of humor. And he encouraged his teammates – until the end. Kraze lost his battle with cancer the following year. I’m sure he carried with him the special memory of beating North Carolina, in what is still considered the biggest win in the history of W&M basketball. But he would never know the legacy he left behind. His teammates and friends carry an image of his fighting spirit and joie de vivre as they live their lives, raise their kids, and deal with adversity. Kraze received the first-ever “Most Courageous” Award from the U.S. Basketball Writers Association. The Tribe basketball program hands out an annual “Kraze Award” to the player demonstrating the greatest spirit and courage. I was taken by the words “All I have.” Players are often encouraged by coaches to “leave it all out there on the court.” Use every drop of energy you have to win the game. Leave nothing in the tank. That was the way Kraze played basketball. It is the way he faced death. It is the way he lived his life. On one cold December night in Williamsburg, I witnessed the greatest basketball game I’ve ever seen. As the final buzzer sounded, I could feel it in my bones: I’d just witnessed something extraordinary. And every time I think about a skinny young man standing at mid-court, with tears in his eyes and hugging his teammates, it hammers on my heart. Thanks to friend Andres Baquerizo, I watched a video on TED.com that made me think of Kraze. Ric Elias talks about what he learned as his plane crashed into the Hudson River in January, 2009. Please watch it, and keep Kraze in mind. I encourage you to use the gifts that God has given you – today and every day. Love life. Invest energy and a little bit of your soul into your friends and loved ones. Don’t wait. What you do – and how you do it – may impact others more than you’ll ever know. Give it your all. I was with you there that night. My Dad is a Tarheel and I couldn’t wait to call him after the game. I couldn’t agree more about the thrill of the game and the memories of Kraze, mostly from the stories you guys told because I was just about to pledge but I could see the impact he had on all of us, the team, our fraternity and everyone around him. How we do anything is how we do everything…. Dale, I love your comment “how we do anything is how we do everything.” I didn’t know Kraze well, but saw the impact that he had on friends and teammates, who were close friends of mine. You must have had an interesting conversation with your dad after that game! Fun post, Karl, and I’m not even much of a sports junky. Athlete, yes, but fan… Not so much. During four years as an undergrad at Georgetown I only attended two basketball games, and that was a double header! But the enthusiasm, the passion, the fulfilled yearning you relate is universal as Ric Elias’ TED Talk reminds us. It’s a good hammering on the heart, and I felt it reading your prose and watching Elias speak. It’s the heartbeat of yearning and knowing we can live our passions. Every day. Thanks, Karl! George, you embody the idea of “living your passions” like few people I know. I’ve told you before, you should be giving TED Talks. You compress more “life” into a month than most people do in a decade. Not every sporting event is a memorable one (quite the contrary), but the opportunity to experience that special event, or see the incredible story unfold before our very eyes… well, that’s what keeps some of us coming back for more. You did it again,Karl! You shared stories that bring the important things in life into focus through real people. I feel privileged to have “met” John Kratzer (“Kraze”) and Ric Elias. I could feel myself cheering at that game as well as bracing for impact on that plane. I could feel “Kraze’s” enthusiasm for life and Ric’s renewed sense of priorities. It seems that daily life can get so busy sometimes. I can feel so distracted by things that don’t really matter and aren’t worth the time and energy it takes to deal with it. Your stories matter and help remind me how precious life is and how I should pay attention to what really matters. Indeed “a good hammering on the heart” is good for the soul. Thanks, Karl and keep writing! Kathy, thank you. The whole notion of “hammering on the heart” made me think about something I read on your Memoir Writer’s Journey blog in Linda Joy Myer’s post. She talked about those moments when you feel lost in something greater than yourself. That is the way I felt at the basketball game – I didn’t watch it, I experienced it. I played no part in the game or the outcome, but absolutely felt connected to the people, the place, the energy, and the unfolding story. You’re so right about the distractions; that’s why Ric’s message seems to resonate so much with me (and why @virtualDavis is such a good example!). Keep coming with these articles. I was at the game, dressed in white, and you describe it well. As you said, sometimes it is retrospection that gives us the best view of what we witness, and we won’t realize it until much later in life. Like having you as a friend. I now value it even more than at W and M.
Mase, thanks for your kind words. I was tempted to include a picture of the “whites,” but it would have been like an inside joke, and most people would have no idea about the crazy bunch at W&M. There’s a picture of us in a 300 year history of W&M called “Hark Upon the Gale.” I’d like to think it was taken at the game with the Tar Heels. I think we all take the personal relationships for granted at the time, but when you compare some of those people and those relationships with the hundreds you’ve had since – you’re able to conclude “he / she was amazing.” I’m glad your students see what I see: a truly special guy. Karl, once again you’ve brought back a great memory with your story. Although I have to say, I think of that night often. It was one of the most memorable nights of my life. I was friendly with a lot of the guys on the team, including John/Kraze. The range of emotions I felt that night was incredibly powerful. I cried when John came on the court at the beginning, cheered as the team pulled into the lead, sobbed at the half-time dedication; and couldn’t stop jumping up and down and hugging my friends when we won. A man sitting next to me turned to me at the end of the game and said he had never seen someone express so many emotions in such a short time span. But it was an amazing night. It did indeed “hammer on my heart”. Michelle, your comment captured all the emotion and magic of the evening. Thank you. It’s been amazing; with each comment from old friends who were there, it allows us to relive the moment and share a special memory. Karl, I was there ,too; Kraze was my friend; You captured it all, Thank you so much!!!! Robert, as I remember, you and Kraze had something in common: you both had friends everywhere you went on campus. I’m not surprised that good guys would gravitate to one another. I’m glad the story resonated – thanks for stopping by! Great article. I too remember that team well; I played for UVA and they came into Charlottesville and beat us. I recall they also took UCLA down to the wire in Pauli Pavillion. Thanks, Otis. They were a tough team. I remember your team as well. A good friend went to UVA and I saw a couple of games at U Hall. Dave Koesters had gone to a rival high school and I was curious to see who this kid Iavaroni was. 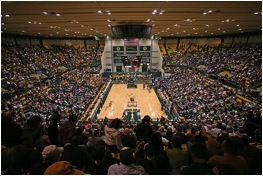 The Parkhill connection also made it interesting when the Tribe played UVA in those days. 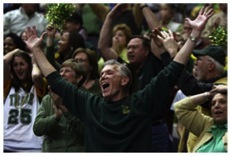 I was a freshman attending the game that night and remember how excited I was that W&M could play with such passion and pull off the unthinkable win! Passion means everything to me and I am constantly amazed by what it can make us all accomplish. I recently had the privilege of hearing Aron Ralston speak and tell his unbelievable story. He continues to be an incredibly upbeat and inspiring person, still passionate about life. Since losing his arm, he has climbed the Colorado 13 ALONE. Thank you for this wonderful trip down memory lane. Many of those players and the ones who joined them in the following couple of years were friends to me. Unfortunately, we also lost Bobby Boyd at a very young age. I have been reading your blog thru some Pi Lam friends on Facebook. You have a gift! Phyllis, thanks for the kind words. I have to believe that hearing Aron Ralston was inspirational. It’s one thing to watch a movie and wonder, “Could I…” It is something else to hear about how he continues to lead his life. Wow. You’re right about Bobby Boyd. I spent a weekend with him in NY at Billy Harrington’s. Great guy, and a sense of humor I hadn’t seen before (on the basketball court!). Thanks for stopping by to share thoughts on that magical night. Jennifer, thanks for stopping by. There’s something valuable about the stories from an institution being passed from class to class and generation to generation. As you know, lots of history at W&M. :) And you’re right – Go Tribe!